Brazil, an upper middle income country, is facing rapid socioeconomic shifts: rural to urban migration, increases in the size of the middle class, and improvements to the distribution of income. These shifts present Brazil’s farm sector with new challenges, including shifts in commodity demand and subsequent changes in economic signals. In this paper, we examine the magnitude of the production challenge from increased food demand and evaluate the farm sector’s ability to meet that challenge. Brazil, a country that enjoys ready availability of land, water and labor has achieved an impressive agricultural performance. From 1996 to 2008, Brazil’s gross domestic product (GDP) of agriculture expanded by an average 12% a year. This growth, driven by increasing productivity and expansion of land devoted to agriculture, has allowed Brazil to become a major food supplier to international markets: a quarter of what Brazil produces in grain, oilseeds and meats is sold in world markets. 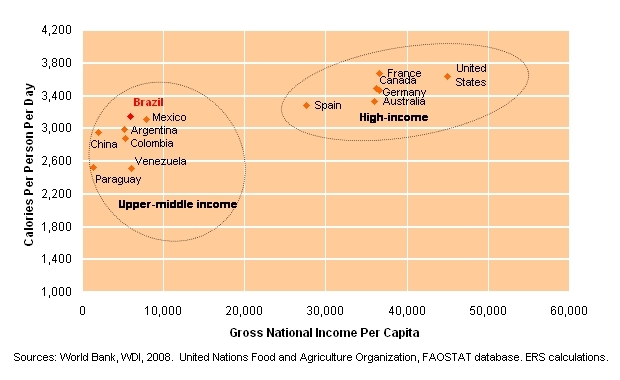 Brazil is also a major consumer of food. With a population of 191 million, Brazil is one of the world’s leading consumers of cereals, pulses, oil crops and meats. Domestic demand is likely to grow as Brazil’s population gains 23 million people by 2018. Income growth, a more balanced income distribution, and increased urbanization are expected to lead to higher demand for all foods, and a shift from staple foods to a diversified diet with higher animal protein consumption. Brazil’s rising food consumption will require continued increases in food supplies. The challenge for Brazil’s farm sector is to sustain productivity growth to meet increasing domestic demand and, at the same time, maintain its position as a major supplier of agricultural commodities to world markets. The growth of Brazil’s biofuel industry could affect the availability of grains and oilseeds for other domestic uses or exports. Brazil’s agricultural system still has much potential to supply more agricultural products if it can address financial constraints for farmers, infrastructure challenges along the food supply chain, and environmental concerns about land expansion. Brazil is categorized by the World Bank as an “emerging country” based on its large population, large resource base, and large market. Brazil is categorized as an upper middle income country with per capita gross national income of $5,860 in 2008. The average masks a disparity between the very rich and very poor. The richest 10% of the population receive 44% of total income while the poorest 50% receive less than 10 percent. Twenty-two percent of the Brazilian population lives in poverty, and rural poverty is especially prevalent. About 8% of the population is below the minimum level of dietary energy consumption (World Bank). Economic reforms implemented during the 1990s and early 2000s in Brazil restored steady economic growth and reduced inflation from over 1,000% per year to around 5%. The resulting economic stability and “wealth effect” from slower inflation set off a domestic demand boom. Other reforms implemented since the early 1990s also helped stimulate food demand. Labor reforms kept the real minimum wage above inflation, trade reforms increased imports of foods and other consumer goods, financial reforms increased credit availability, and family farming programs provided credit to low-income, small-holdings producers (owning less than 26 hectares of land). Brazil implemented some programs aimed at reducing income inequality. Food assistance programs established under the “Zero Hunger” (Projeto Fome Zero) government initiative provide low-income program participants with supplemental food. Bolsa Familia is a targeted conditional cash transfer program serving nearly one quarter of Brazil’s population (MDS). The economic reforms implemented after 2003 led to increases in real per capita income, and an improved income distribution. Real per capita income increased 14% from 2004 to 2007 and the inequality in the distribution of income, measured by the Gini coefficient (which ranges from 0, which reflects equality, to 1, which indicates inequality), diminished from 0.6 in 2000 to 0.5 in 2007. The reforms brought more people into the formal labor force and expanded the middle class (defined as families earning between $600 and $2,600 monthly), to 54% of the total population in 2008, up from less than 42% in 2004 (Neri). 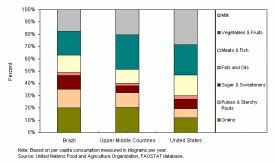 With growth in per capita income, Brazil’s food consumption, measured by calories per person per day, has grown steadily from 1980 to 2007 at an annual rate of 0.8% and now exceeds the average for upper-middle-income countries. Food consumption in Brazil is shifting toward vegetables, fruits, oils, meats and milk. Consumption of meat and milk is expanding the fastest. By 2008, total red meat and poultry meat consumption had risen to 89 kilograms per person, 31 kg above the 1993 level (USDA, 2009). Per capita consumption of milk has risen to 112 kg in 2008, up 20 kg from 1993, aided by milk donations to low-income populations through the food and nutrition security programs (Bolsa Familia and School Meals programs). Rising incomes have led to increased consumption of some grain products with consumption of 131 kg per person in 2008, up 6% from 1993. Rice and wheat are the most popular cereals, with 41 kg and 52 kg per person, respectively, in 2008. Consumption of staples (beans and starchy roots) has reached 97 kg per person, and vegetable and fruit consumption have also been on the rise, with a 12% gain in vegetable and fruits consumption since 1993. Sugar consumption—currently double the world average—reflects abundant domestic supply and low price (FAOSTAT). As Brazil becomes more urbanized and Brazilian consumers grow wealthier, the composition of food demand will move towards that of higher-income countries (Figure 2). To match average consumption shares in high-income countries, consumption of meat, vegetables, fruit and milk would grow the fastest. Consumption of pulses will be relatively unaffected by urbanization since urban and rural consumption levels are similar. USDA Agricultural Projections to 2018 indicate that 2.9% annual Brazilian income growth will lead to gains in consumer spending on food. Per capita consumption of red meats and poultry will increase from 89 kg per person in 2008 to 92 kg per person in 2018. Poultry will be the fastest growing component of meat consumption with its share of meat consumption increasing from 45% in 2008 to 47% in 2018. While per capita beef consumption is projected to decrease 0.2% per year during 2008–18, per capita poultry and pork consumption will rise steadily with increasing incomes (0.8% and 0.2% per year, respectively during 2008–18). Overall food use of grains is projected to decrease; this will likely occur through shifting of coarse grains to feed use, but wheat and rice consumption will rise to levels observed in the high-income countries. Brazil’s per capita demand for wheat is projected to rise to 56 kg per person by 2018, or 7% above the 2008 level. Consumption of rice, a major staple in the diet of more than half of Brazilians, is projected to grow to 43 kg per person by 2018, a 5% increase from 2008. Sugar consumption is expected to decline to levels similar to that of higher-income countries, leaving more sugarcane available for biofuel production. About 53% of Brazil’s sugarcane is being distilled into fuel ethanol. Brazil’s ethanol domestic demand has increased 3% per year since the late 1990s, as sales of “flex-fuel” cars powered by gasoline and ethanol in any proportion in a single tank of fuel have boomed with the increase in the income earnings of Brazilians. Ethanol represents 41% of gasoline use in Brazil, compared to 7% in the United States. Brazil’s ethanol consumption is projected to rise to 14 billion gallons by 2018, compared to 4.3 billion gallons in 2008 (MAPA). USDA Agricultural Projections to 2018 indicate that Brazil will need to produce 7% more grain and 43% more oilseeds from 2008 levels to meet projected domestic and foreign demand in that year. This is in response to increased demand from major soybean importers—such as China, and reduced soybean exports from the United States. More than 57 million tons of feed grains are projected to be needed to supply Brazil’s livestock sector, 6% more than was consumed in 2008. To meet domestic and foreign demand for fuel ethanol, ethanol production is projected to rise to 16 billion gallons by 2018 from 7 billion gallons produced in 2008. Brazil’s ethanol exports are expected to increase an additional 1 billion gallons, to 2.3 billion gallons by 2018 (MAPA). This increase in ethanol exports could help the U.S. meet ambitious biofuel demand targets under the 2007 Energy Independence and Security Act (EISA). The law allocates 3 billion gallons out of 26 billion in 2018 for renewable fuel other than ethanol derived from corn starch, a category that could include imported sugarcane-based ethanol. Brazil will need to import the commodities that it does not produce competitively, including wheat and rice, two commodities that Brazilian consumers are expected to demand at a slightly faster rate over the next decade, as incomes grow. Wheat imports, which for the past decade have accounted for over two thirds of supply, are projected to increase to 7.4 million tons in 2018, a 376,000 ton increase over 2008. The main suppliers of wheatto Brazil over the past decade have been Argentina, the United States, and Canada. Brazil is usually a net importer of rice and its imports are projected to increase 26% to reach 43 kg per capita in 2018. 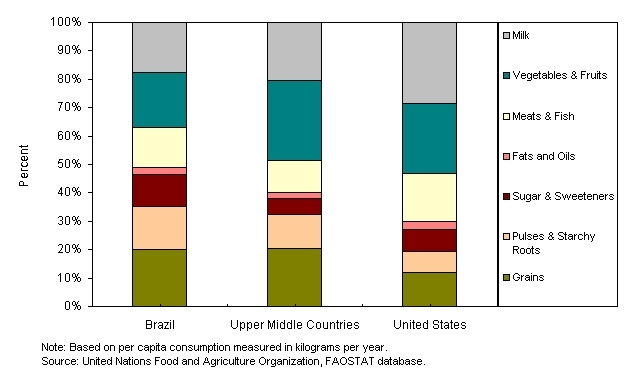 Brazil produces most of the foods it consumes. It has increased output four-fold since the 1970s through technological improvements, expansion of cultivated area, and shifting production from smallholders to large scale farming to achieve economies of scale. Large-scale agriculture now accounts for over three-quarters of total grain, oilseed, and meat production. The increasing government investment in agricultural research since the 1970s, carried out through the Brazilian Corporation for Agricultural Research (Empresa Brasileira de Pesquisa Agropecuária, EMBRAPA), a public company linked to the Ministry of Agriculture and Food Supply, is credited with stimulating the rapid expansion of the land base and increasing agricultural productivity, with the greatest gains for soybeans, cotton and rice. Yields of beef, pork and poultry meat also increased significantly. Recent gains in area and yields for soybeans and corn reflect Brazil’s response to the growth in export markets and the expansion of Brazil’s hog and poultry industries (Table 1). This agricultural productivity growth helped Brazil meet domestic demand while increasing exports. Brazilian farm exports performed strongly between 2003 and 2008, increasing at an annual rate of 22% in U.S. dollars terms. Brazil is the largest world exporter (global market shares in parenthesis) of sugar (48%), ethanol (40%), beef (18 percent), coffee (30%), and orange juice (39%); and second largest exporter of soybeans (32%) and poultry meat (27%), after the United States These gains are also reflected in the loss of market share by the United States. Despite its successes in expanding production, Brazil’s future growth in agriculture could slow unless it can address financial constraints for farmers, infrastructure constraints along the food supply chain, and environmental concerns about land expansion. In addition, the growth of Brazil’s biofuels industry could reduce the availability of Brazil’s exportable surpluses of some commodities. Demand for soybeans as a raw material for biodiesel will likely increase use of Brazil’s excess crushing capacity and dampen the recent boom in soybean exports. Planned increases to Brazil’s biodiesel mandate from the current 3% of transportation fuel would likely reduce soybean oil exports. Lack of credit is a constraint on farm investment and output growth but prospects for farmers’ access to credit for production and marketing of crops and livestock are poor due to the currently high rate of indebtedness in the sector. In Brazil, the cost of credit is high and its availability is limited. Total credit granted by the financial system is less than 30% of GDP, which is one of the lowest levels of credit availability anywhere in the world. During the past 10 years, to alleviate the low official credit availability, input supply companies and trade companies provided the bulk of production financing for farmers, a critical factor in the expansion of the agricultural sector. However, the current global financial crisis has reduced the ability of these companies to finance farmers in the near term. Many Brazilian farmers are now struggling to pay debts. Brazil’s agriculture-related debt in arrears in 2008 reached 7% of agricultural GDP (Banco Central). Infrastructure bottlenecks are the main obstacle to Brazilian agriculture’s capacity to supply domestic and world markets. Poor roads impose high costs on farmers in the agricultural frontier in the Center-West region, where the crops have the highest yields in the country. Large investments in maintenance and expansion of transport infrastructure are needed to keep up with the expected growth in demand, to lower delivery times and costs and to maintain product quality. In recent years, private investment in infrastructure has exceeded federal investments, and new Public-Private Partnerships (PPPs) have been improving roads and port facilities. The Brazilian Government estimates that it needs to invest $200 billion in infrastructure over the next decade. Potential for output growth from bringing more land under cultivation is limited. Although there is still land available for crop and livestock expansion, continued expansion in the Cerrados (savannah areas) and Amazon region is likely to be constrained by environmental concerns about land clearing. Based on yield projections, the projected production levels in 2018 assume that an additional 10 million hectares of cropland will be brought into production. The expected rate of expansion for new area brought into crops production is one of the world’s highest at 2.1% per year over the next 10 years. This expansion in cropland is likely to come from new land brought into production and from converted pasture land. Pasture land is expected to decline as cattle growers adopt new technologies and feeding practices. Brazil’s current agricultural area totals 76 million hectares, with 58 million hectares of annual crops and 18 million hectares of perennial crops. Pasture lands now stands at 172 million hectares. The scope for cropland expansion in Brazil is estimated at 119 million hectares, with 69 million hectares in the Cerrados, and 50 million hectares from pastureland conversion. Biofuels production in Brazil is facing increasing pressure to respond to environmental sustainability concerns related to land use of cropping systems (sugarcane, soybean and palm oil plantations) to produce biofuels and land use change impacts. Frequently cited are the environmental risks from intensified competition for land currently planted to other crops and the conversion of forest or grassland to crop production which may result in habitat loss. Sugarcane area is projected to increase 2.2% annually during 2008–18, from 8 million hectares in 2008 to over 10 million hectares in 2018, driven by biofuel demand (MAPA). Over the past two decades, Brazil’s rapid economic growth has been driven by stabilization and structural reforms that have led to high rates of investment and gains in productivity throughout the economy. Reforms led to growth in employment and income, improved income distribution, poverty alleviation, and stronger food demand. More consumers are participating in formal markets, expanding the quantity and quality of food products demanded by Brazilian consumers. As household incomes rise the structure of Brazilian food expenditures is changing, with demand shifting toward fruits, vegetables and meats. At this point, it appears that Brazil will be able to meet these challenges and that the agricultural sector will produce sufficient quantities of food to meet domestic demand and—depending on future changes to Brazil’s biofuels mandate—exports as well. Brazil’s impressive agricultural performance of the past few years is likely to continue, despite the pressures faced by the farm sector. On the positive side, productivity advances for crops and animal products seems almost guaranteed given the anticipated supply of improved seeds, soil correction techniques, and other technologies generated by EMBRAPA. In addition, the Public Private Partnership (PPP) initiatives will enable accelerated investment in the much needed transport, ports and storage infrastructure. The large investments needed for infrastructure development, and budgetary constraints make PPPs the most viable option. These positive factors will minimize the pressures from the lack of credit availability, and the rapid growth of the biofuel sector, allowing Brazil to meet the new challenges from changes in dietary consumption patterns. Food and Agriculture Organization of the United Nations, FAOSTAT, http://faostat.fao.org/default.aspx; Accessed March 29, 2007. Neri, M. (2009, March). Crônica de uma crise anunciada. FGV, Revista Conjuntura Econômica. http://www.fgv.br/cps/crise/; Accessed on April 17, 2009. USDA Agricultural Projections to 2018. (2009, February). OCE-2009-1, USDA, Office of the Chief Economist, World Agricultural Outlook Board. www.ers.usda.gov/publications/; Accessed on April 24, 2009. World Bank. (2008). World Development Indicators, WDI Online. http://publications.worldbank.org/WDI/. Source: Foreign Agricultural Service (FAS), U.S. Dept. of Agriculture. FAS Production, Supply and Distribution Online. Constanza Valdes (cvaldes@ers.usda.gov), is Agricultural Economist, U.S. Department of Agriculture, Economic Research Service, Markets and Trade Economics Division, Washington D.C., USA. Ignez Vidigal Lopes (Ignez.Lopes@fgv.br), is Head of the Center of Agricultural Economics Studies, Getulio Vargas Foundation. Rio de Janeiro, Brazil. Mauro de Rezende Lopes (Mauro.Lopes@fgv.br), is Research Project Manager of the Center of Agricultural Economics Studies, Getulio Vargas Foundation. Rio de Janeiro, Brazil.